Refractive errors exist when the length of the eye and its optical power mismatch. 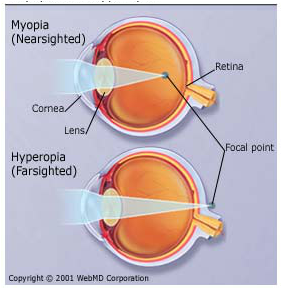 There are two broad classes of refractive errors, myopia, where the eye is too long for its optical (refracting) power, and hyperopia, where the eye is relatively too short for its optical power. Most of us are born with significant refractive errors, as are most young animals, but these refractive errors generally disappear with development. This process is termed emmetropization, and while at least part of the refractive changes can be explained as an optical consequence of normal developmental eye enlargement, there is now convincing evidence from animal studies that eye growth is actively regulated and vision-dependent. Specifically, emmetropization is dependent on normal visual experience, and when this is lacking, refractive errors are the end result. What do we know about emmetropization and the processes leading to the development of myopia? Early animal studies made use of a form deprivation paradigm. In most young animals, form deprivation, either using diffusers to cover the eyes or lid suture, leads to excessive eye growth and axial myopia. In human infants, cataracts and ptosis impose equivalent conditions and have also been linked to excessive eye growth. These studies imply that normal visual experience is required for normal refractive development. In normal development, emmetropization eliminates pre-existing refractive errors. However, experimentally imposed focusing errors (refractive errors) also trigger emmetropization: for example, with hyperopia imposed with negative defocusing lenses, the eye elongates and with imposed myopia (with positive defocusing lenses), eye growth is inhibited. In both cases, the end result in young animals is emmetropia with the lenses in place. Without the lenses, these eyes are myopic in the former case (lens-induced myopia), and hyperopic in the latter case (lens-induced hyperopia). Young chicks are able to compensate for a wide range of imposed focusing errors in this way, but this capacity is not unique to chicks; other animals, including tree shrews and monkeys show active emmetropization although their response ranges are more limited and the timing of such treatment seems to be more critical to effective compensation.